Sam’s Brown and Blue Striped Shirt has thick brown (or possibly black) stripes by the buttons, and a thin blue stripe as a sort of vertical “connect the dots” line between the buttons. That’s a poor description – basically the shirt is blue and brown with good sized stripes. In Home (1x09), Sam put on this shirt when he, Dean, and Missouri try to figure out what has infected his former ‘home’ (if it can be called that when he only lived there for the first 6 months of his life). He keeps the shirt on throughout the subsequent poltergeist/ghost encounter, but changes before the final goodbye scene. In Nightmare (1x14), Sam starts wearing the shirt after the failed attempt at rescuing Roger Miller. He keeps it on while through the rest of the main action of the episode, but changes for the final scene. 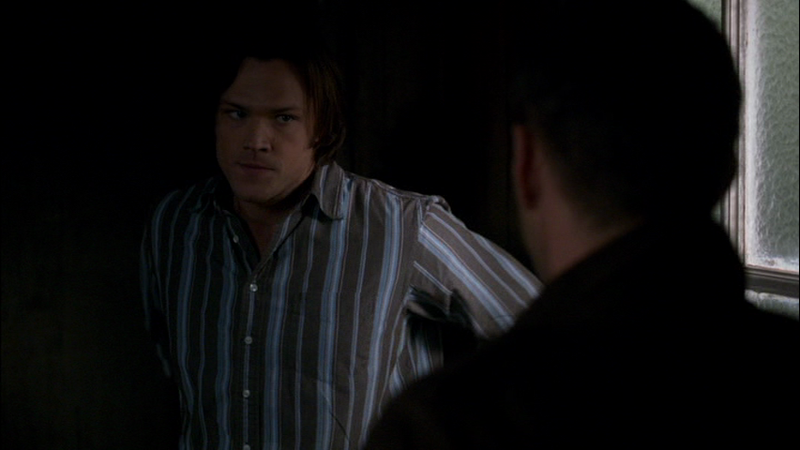 In Hell House (1x17), Sam wears it while he and Dean are hanging around the motel researching after first encountering the Tulpa – he is still wearing it when they take off to confront the record shop guy about lying. In Provenance (1x19), Sam wears it the day after they find the old dead woman in her house through to when he and Sarah battle the ghost. 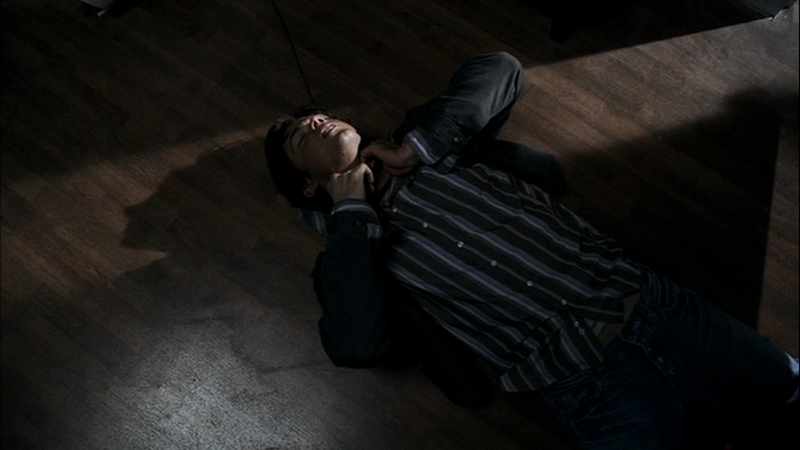 In Bloodlust (2x03), Sam wears it for the entire episode – except for when he wears a suit to interview the sheriff and go to the morgue. In Nightshifter (2x12), Sam is wearing this shirt for the entire time he is at the bank (it is underneath a security costume when he first arrives). In Dream A Little Dream Of Me (3x10), Sam is wearing this shirt when he shows up at the hospital with the information about the dream root. He keeps it on until they successfully get Bobby to wake up. In The Real Ghostbusters (5x09), Sam wears it at the end of the episode when he says goodbye to Chuck and Becky. In Unforgiven (6x13), Sam wears this shirt after he escapes from jail. He keeps it on until they kill the Archne. In Season 7, Time for a Wedding (7x08), Sam wears this shirt when he and Becky arrive in Delaware and RSVP for the reunion, and then have a “romantic” dinner at Becky’s apartment. This is my favorite shirt of his, mainly because it's been the one I could most easily recognize that he had since Season 1 upwards. I would have to wonder though how it still fits him :p maybe that's why Sam has so much for clothes due to how much Jared has grown and gained more muscles since Season 1. I also think it's about the KIND of clothes they were. Dean tends to wear staples - a basic type of shirt that a company might make every single year. Whereas Sam tends to wear unique shirts, items that you can't replace with lookalikes...though, that's a very outthere theory. I'm sure it's probably mostly to do with the fact that Jared has grown so much since S1. i really like that shirt, it's the first one I ever saw him in, looks cool, wish I could find one over here like it. I must have missed it, but where is the shirt he was wearing in 7x02, at the end when he gets knocked out by the Leviathan? This is a great little site, it's brilliant, so dedicated. Any chance of season eight styles coming up? Season 8 clothes will be added in the fall sometime after the DVDs come out. I wait for the DVDs so that I can do my own screen-caps.